The property passed through many phases of development being operated in the past as a coffee plantation, a citrus plantation, a cattle rearing farm and a dairy. The property was even at one time leased to Willing Mullings who used the Great House to operate a small hotel for a number of years. In 1925, the property was purchased by Guy Winchester Harris who effected a number of changes to the building which housed the hotel. The property was sold in 1962 to Richard Harris who operated a dairy. The majority of the land was again sold in 1966. 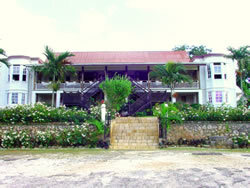 In 1972, Guy Barrington Grant purchased the property on which the Great House now stands. Today, the property is operated as a Restaurant and Gift Shop.